First of all, is anyone as surprised as I am that this blog has been running for over 18 months?? That means that it’s time to update and catch you up on how I do some of those things now vs then! 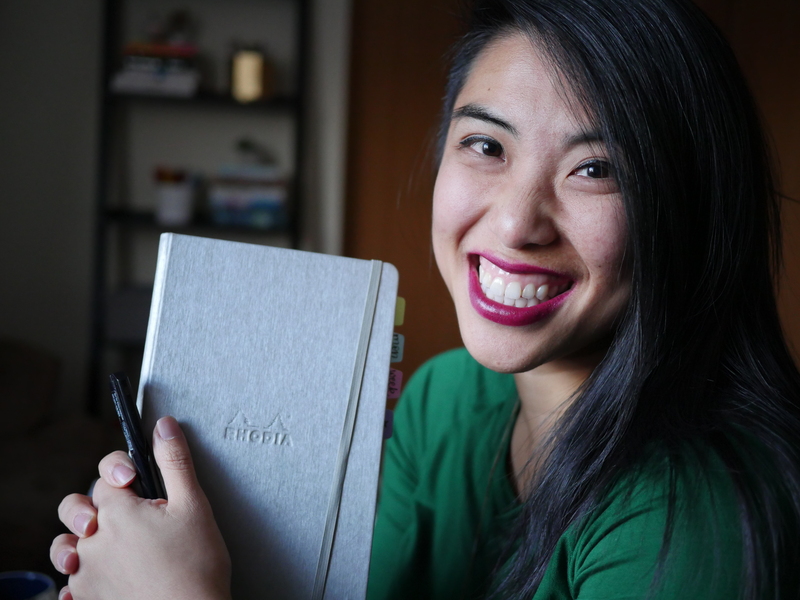 Today I’ll be catching you up on how I do finances and budgeting in my bullet journal. Check out how I have done finances in the past, and dive into today’s refresh. Note: This post contains affiliate links, meaning if you happen to buy something, I’ll make a small commission at NO additional cost to you! The proceeds help support giveaways, reviews, etc. Thank you for your support! As with most of my posts, I recommend listening to the video – where I can elaborate more readily and easily my larger thoughts around this complex topic! I begin with my Net Income at the top – this means my paycheck after taxes, insurance, or any other deductions you have taken out. I have decided to use months as my increment of time since my bills come in monthly and it’s a neat cut off – for you a 2 week window or “per paycheck” method might work for you, so adjust accordingly. Expenses are anything I essentially have on autopay (bills, sob sob) as well as the stuff I need to consistently buy every single month like groceries or gas. To calculate this I look back on old statements to get an average amount I spend on each thing. Savings goals are a line item I add into expenses so I can prioritize investing in my Future Self as well as spending on my Present Self. To calculate this I created the second page, to identify what the hell I’m even saving for. Here’s where you do some Heart work – what is this all for?? What are you making money for and spending so much time and energy in exchange for? The first is an emergency fund. If you are able to do have a cushion, the general rule of thumb is 3-4 months worth of your expenses (refer to your expense chart). In tough financial times, 6 months is preferable – but definitely not accessible for everyone, so keep that in mind. Next is retirement. I’ve heard the general rule is like 15% of your income going to your Future Self – once again, MOST people do NOT have the ability to do this… so adjust to what you can do. Make the right choice for your situation – I do not have kids and live in a moderately priced area (read: not San Fran or New York City, but also not Bowling Green, Ohio), so I can make certain choices that you may not be able to. Know your own context. Some of my other savings priorities are traveling, gifts/spending on others, and “Something Big.” At this point I’m not sure what’s next in terms of major events – so… I’m calling it this until I can identify whether that’s a big move to a new state, house, whatever. Try to add an estimated timeframe for any of these goals to get a sense of how much you’ll have to put away per month to reach those targets. Add all those savings goals up to get your monthly “savings goals” line item. This might be beyond what you can do – and that’s okay! Adjust to what makes sense for your income. If you find that you want to save more, look at where you can pare down. Many of us have areas we can trim back without realizing it. From these numbers, I get my Discretionary Budget. That is the leftover number after I pay bills and pay my Future Self. This is my budget for anything like clothing, eating out, entertainment (as a concert, movie, and theater junkie… this is the toughest), etc. I AIM to stay below this number every month. In the past, I would create super detailed budgets in each category every month… but tracking and separating all the numbers became super cumbersome which deterred me from sticking with it. So, I made it simple and knew I could always go back and categorize if I needed to later, if I was curious. This makes it easier to just subtract down to zero. In my weekly layouts, I have a line for my gratitude log and a line for my expenses. This way I can jot down whenever I spend money. My goal is to revisit these numbers at the end of every month to see how I’m doing on the budget and readjust as needed. Something I haven’t talked too much about is how you choose to spend your money and what is deemed “necessary” or not. That is a very personal choice. I am tired of people telling others how to spend their money – whether that’s the popular “If you just stop drinking Starbucks” adage or something else… frankly, it’s similar to the “don’t judge me only because I sin differently from you.” It’s also true for money. I might spend money on something like coffee but not on alcohol; someone else might spend money on eating out because they don’t travel, and so on. Do what you need to, it’s your truth and your priorities. The hardest thing for me to do is to balance paying off the Past, enjoying my Present, and investing in my Future… I’m still figuring it out. Do you have any tips or how you’ve done financial tracking in your bullet journal? I’d love to hear down below! What luck! I just opening my journal and I was going to tackle my financial page!! Thank you so much, don’t mind if I borrow a few of your ideas?! I would not mind if you borrowed some ideas! Have you been able to use them? haha yes!! hexagons are nice shake-up from my usual list straight down 🙂 thanks for reading!! I love those stamps – they’re not only cute, they are quite useful! The best advice I can offer is don’t even go there/open the app unless you really, truly need something. Amazon is my biggest problem as I am truly an idiot with money. I’m not saying that to be mean to myself – I’m saying it because it’s true!! I actually have a person who manages my money. I am much older than you are and have killed more checking accounts than I can remember. I also have a problem with impulse buying at the grocery store. Now I take my 10-year-old niece with me and she is quite a stickler about buying only things that on the list! Jessica, I’m a huge fan of your blog! I have the afternoon off today and can’t wait to read through this and work on my own budget. That sounds very strange but it’s true, and a testament to you and the power of journaling. I have started a financial journal and wish to rewrite some of the pages because they have proven very useful, and I will probably share this with others when I get it done. I think I’m going to start using a large size notebook (8×10.5) for this to get more on one page. You are an inspiration. Thanks again!! Ah that’s so sweet thank you! Have the ideas been useful so far?? Your idea is indeed very inspiring. Thank you, Jessica. Has been wondering how i should make my budget, now I know it better. Thank you once again for your inspiration. I’m glad to be helpful 🙂 How has it worked for you so far?